George Baxter (1804–1867) was an English born artist and printer based in London. He is credited with the invention of commercially viable colour printing. Baxter was born in Lewes, Sussex, the second son of John Baxter, a printer. 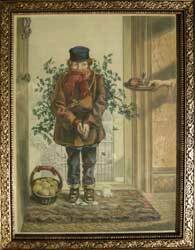 At 20, Baxter was illustrating books printed by his father; at 23 Baxter moved to London to be apprenticed to Samuel Williams, a wood engraver. In 1827 Baxter set up business on his own and married Mary Harrild. The following year Baxter began to experiment with his own methods of colour printing with the use of woodblocks – his first known colour print, Butterflies, was published in 1829. In 1835 Baxter was granted Patent No. 6916 – Improvements in Producing Coloured Steel Plate, Copper Plate and other Impressions, which outlined the combined intaglio and relief process he would continue to use for the next thirty years. Despite his technical excellence and the general popularity of his prints, Baxter’s business was never profitable – his process was laborious and it seems likely that his perfectionism prevented him from completing many of his commissioned works on time. 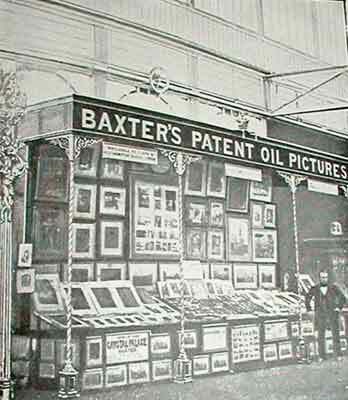 A number of printers purchased a licence from Baxter, following the renewal of his patent in 1849. The most well known of these was Abraham Le Blond. Baxter's process for producing colour prints combined relief and intaglio printing methods. A 'key' plate was prepared, usually made of steel and using any combination of engraving techniques. Following printing of the key plate, relief blocks were prepared, usually from wood but also from zinc or copper, using impressions of the key plate to create the blocks. Usually one block was prepared for each colour, each being superimposed on the other, although sometimes two or more colours or tints were included on the same block, requiring hand inking of each individual area. Sometimes up to 24 separate colours were used, although ten could be considered an average number. Hand colouring was frequently used to highlight certain areas as well as a hand applied glaze. His work was widely used by the London Missionary Society and attracted great interest from the Royal Family, especially Prince Albert who encouraged Baxter to exhibit at the Great Exhibition of 1851. Baxter produced large quantities of about 400 different subjects and brought colour printing to the masses. Although his work was initially used as book illustrations, he soon found a market for his prints as decorative subjects for the home and was a catalyst for many other printers who recognised the commercial potential of this type of work. 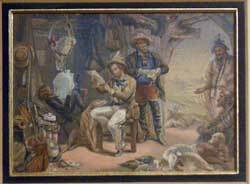 Baxter's skill and talent as an artist is unquestionable, but as a businessman he was unable to convert his talent into commercial success.Baxter's printing business ended in bankruptcy in 1865 after experiencing financial problems for many years. 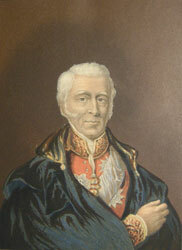 George Baxter died in 1867, after an accident involving a horse omnibus. His legacy of prints have now become collectors items. The CL#s quoted below refer to C. T. Courtney Lewis: George Baxter ( colour printer ) his life and work: a manual for collectors Publisher: Sampson Low, Marston & Company, ltd. London, 1908. The NG#s quoted below refer to the work Colour Prints by George Baxter - the William Crowley Jephcott Collection in the National Gallery of Canada, Ottawa 1960. George Baxter after Lemuel Abbott 20 Apr 1853. 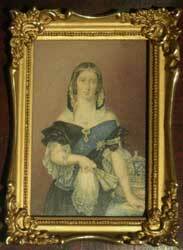 Glazed and set into period original black lacquer frame with acorn hanger frame. 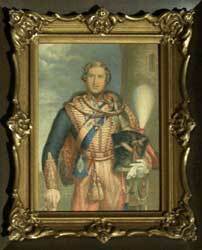 7 3/8 x 6 1/4" Image: 4 1/4 x 3 1/8"
THE LATE DUKE OF WELLINGTON (with arm.) George Baxter / Abraham Le blond after Sir Thomas Lawrence 1852 glazed and set into period original black lacquer frame with acorn hanger frame 7 3/8 x 6 1/4" Image: 4 5/8 x 3 3/8"
Sketched from No. 1. 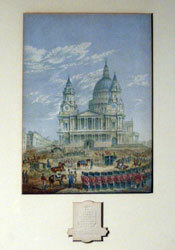 St. Paul's during the funeral. miniature. "Copenhagen", the Duke's horse, is in the centre and the other detail is worth studying. 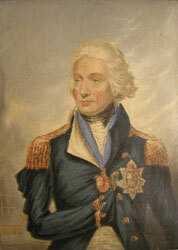 The body of the Iron Duke had been removed from Chelsea Hospital to Horse Guards. The funeral procession was so large that it took an hour and a half from the procession starting before the Funeral Car itself was in motion. There were 15,000 persons in the Cathedral and millions lined the procession route.11 1/4 x 9" Image: 6 x 4 3/8"